or moderately variable. Oil palm trees influenced soil development with its effect on silt content at 30 - 60 cm depth. palm production. Also extractable copper and zinc were found to have made large contributions to FFB and oil palm. precise administration of nutrient demands for management of a major production constraint which is soil fertility. million acres. Average yields are 10,000 lbs/acre (i.e. oil palm is more than 4-folds that of any other oil crop. roots are found within the first 60 cm of the soil . tion was carried out through hydrometer method . (ECEC) was determined through summation . carried out using SAS . dian and mode of the variable measured were similar. coefficient of variation of 49.6% and 55.6% respectively. activity and displacing loosened clasts . nificant difference was not observed at 30 - 60 cm depth. Table 1. 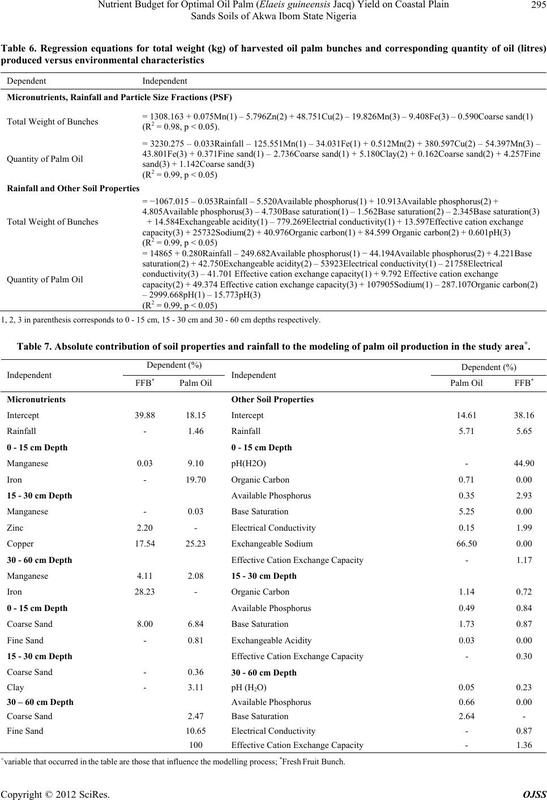 Descriptive statistics of the soil properties in the palm plantation. *Neither significant at 1% nor 5%; SE: standard error; CV: coefficient of variation; Skew: skewness. Table 2. 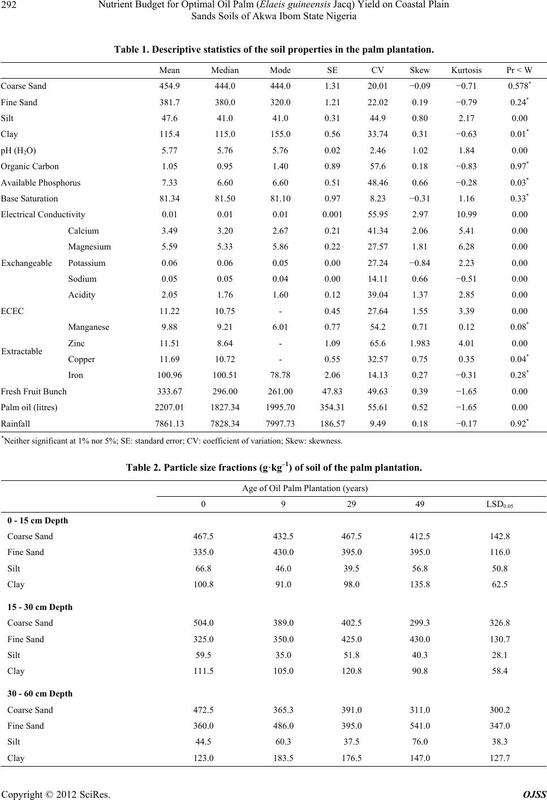 Particle size fractions (g·kg–1) of soil of the palm plantation. Table 3. 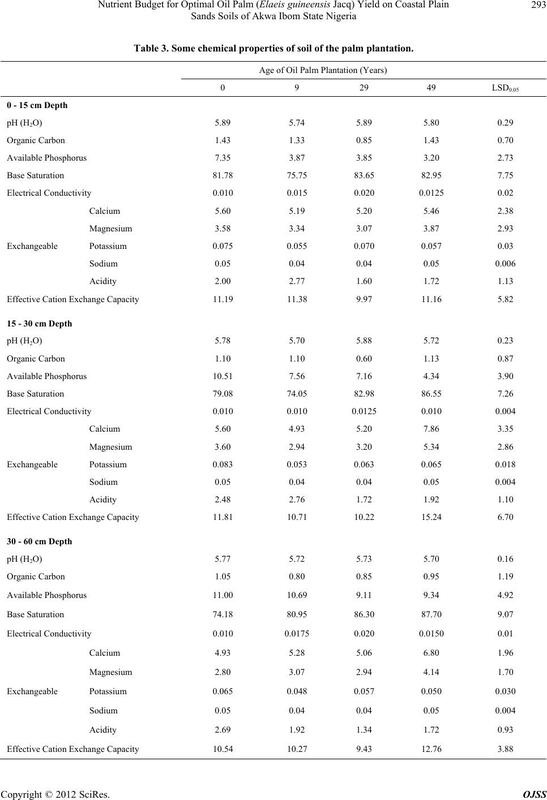 Some chemical properties of soil of the palm plantation. Table 4. Ratios of some exchangeable bases. Table 5. 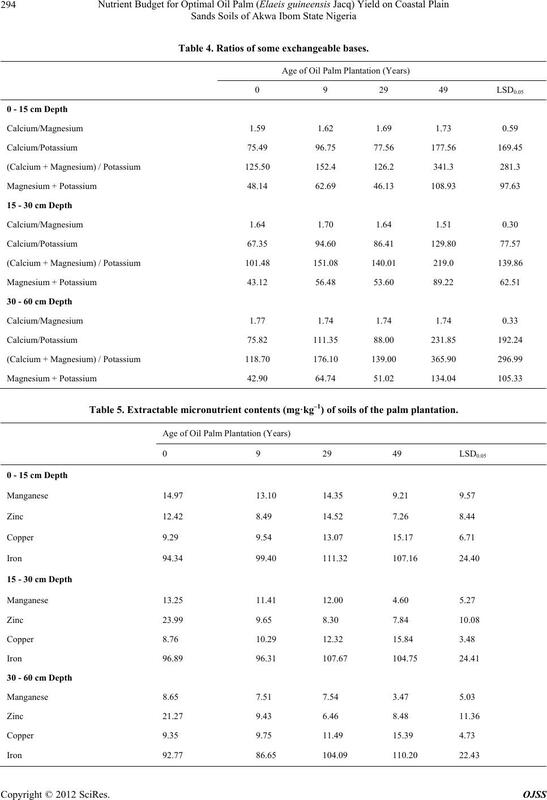 Extractable micronutrient contents (mg·kg–1) of soils of the palm plantation. (R2 = 0.98, p < 0.05). 1, 2, 3 in parenthesis corresponds to 0 - 15 cm, 15 - 30 cm and 30 - 60 cm depths respectively. Table 7. 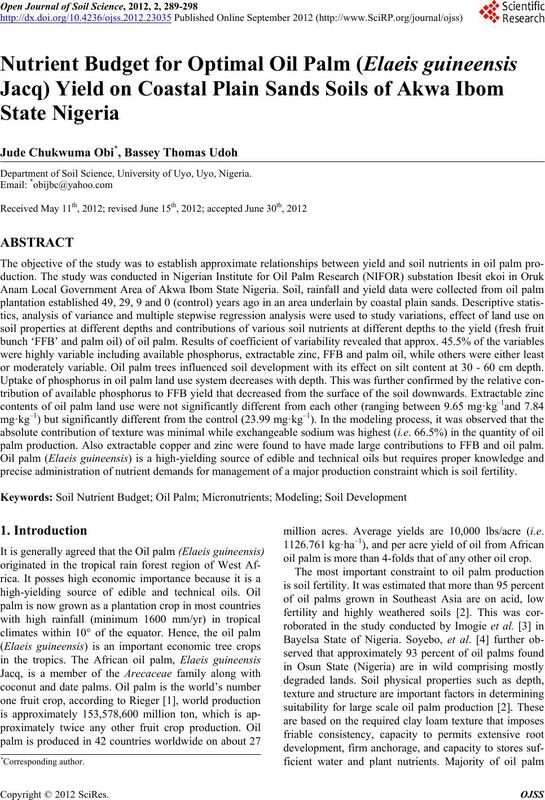 Absolute contribution of soil properties and rainfall to the modeling of palm oil production in the study area +. +variable that occurred in the table are those that influence the modelling process; *Fresh Fruit Bunch. significantly different from the control (23.99 mg·kg–1). nificantly changed at other depths but 30 - 60 cm depth. rainfall especially in coastal plain sands soils [30-32]. manifested its importance in almost the entire models. proper nutrient management in oil palm enterprises. 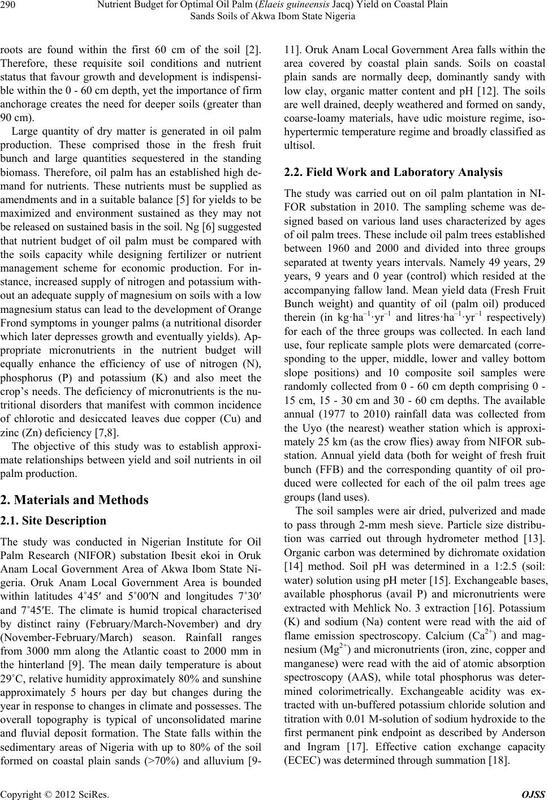 Soil Science, Vol. 10, No. 1, 2005, pp. 55-59. 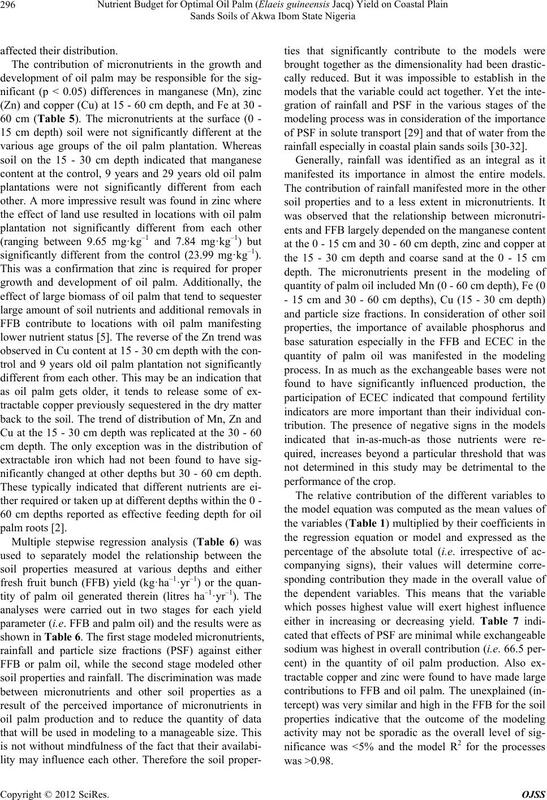 Oil Palm Research, 2000, pp. 411-440.
neux, Vol. 32, No. 5, 1977, pp. 197-209.
ture, Serdang, 28 March 1983, pp. 763-779.
vey, Classification and Genesis of Acid Sands,” In: E. J.
Nigeria, Soil Science Society of Nigerian, 1981, pp. 1-7.
ria and Measures for Control,” In: E. J. Udo and R. A. Science Society of Nigerian, 1981, pp. 151-165. Journal, Vol. 50, No. 1, 1986, pp. 154-160.
rica, Madison, 1986. pp. 404-407.
and Soil Science Society of America, Madison, 1982, pp. E. O. McLean, “Soil pH and Lime Requirement,” In: A. I. 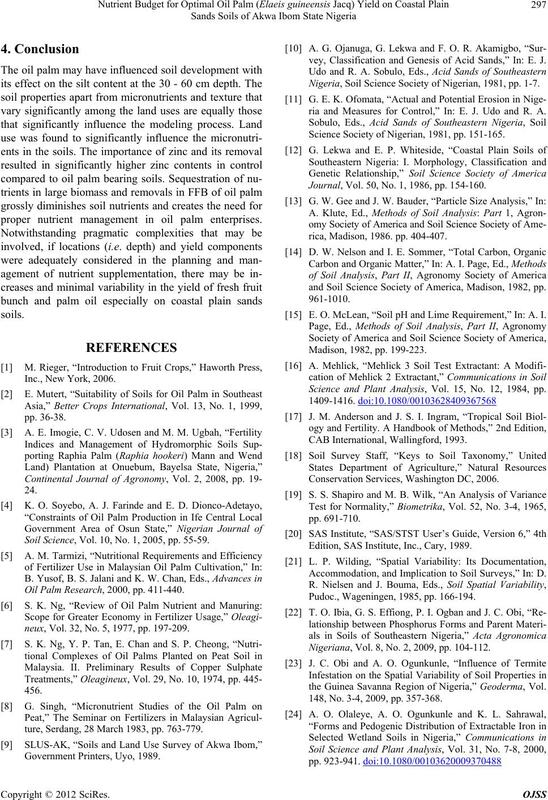 Science and Plant Analysis, Vol. 15, No. 12, 1984, pp. Conservation Services, Washington DC, 2006. Edition, SAS Institute, Inc., Cary, 1989. Accommodation, and Implication to Soil Surveys,” In: D. Pudoc., Wageningen, 1985, pp. 166-194. Nigeriana, Vol. 8, No. 2, 2009, pp. 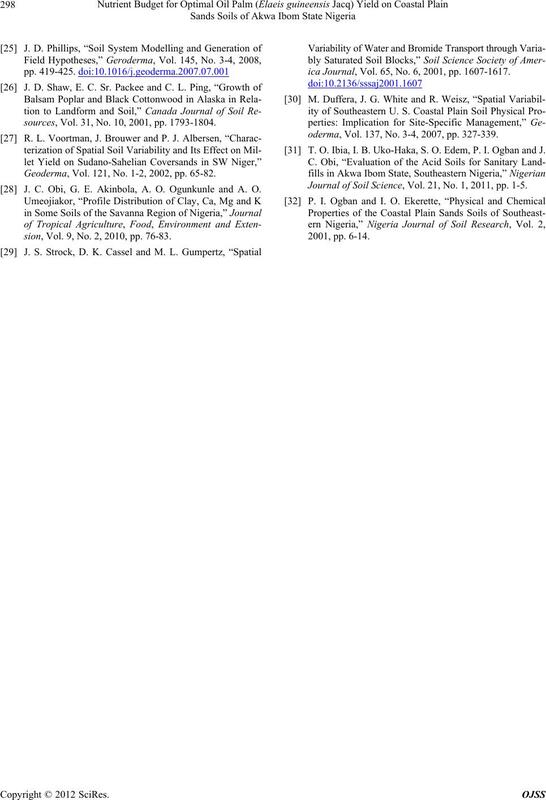 104-112.
the Guinea Savanna Region of Nigeria,” Geoderma, Vol. 148, No. 3-4, 2009, pp. 357-368.
sources, Vol. 31, No. 10, 2001, pp. 1793-1804. Geoderma, Vol. 121, No. 1-2, 2002, pp. 65-82. J. C. Obi, G. E. Akinbola, A. O. Ogunkunle and A. O.
sion, Vol. 9, No. 2, 2010, pp. 76-83.
ica Journal, Vol. 65, No. 6, 2001, pp. 1607-1617.
oderma, Vol. 137, No. 3-4, 2007, pp. 327-339. T. O. Ibia, I. B. Uko-Haka, S. O. Edem, P. I. Ogban and J. 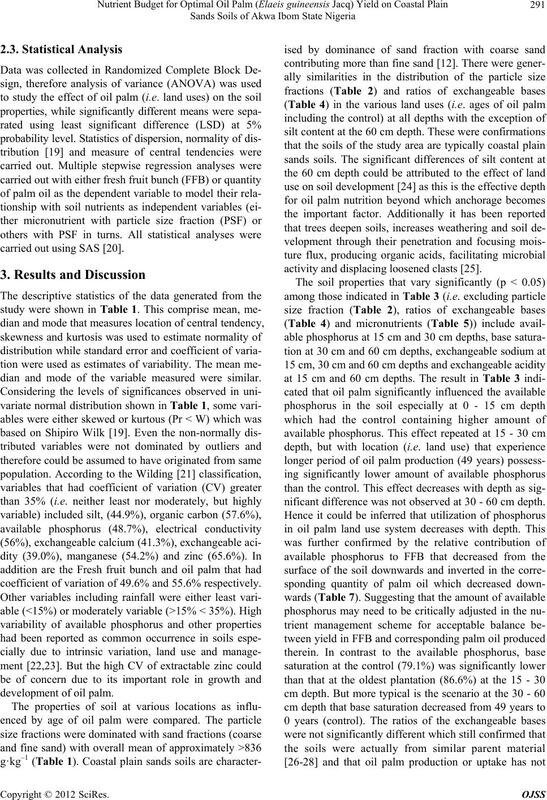 Journal of Soil Science, Vol. 21, No. 1, 2011, pp. 1-5.